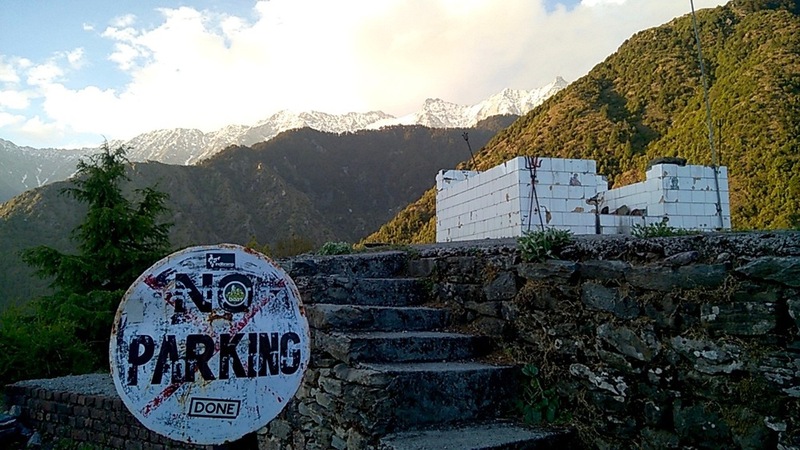 May 13 The best viewpoints in Mcleodganj no—one will tell you about. Runners up - Durga Temple and Tibetan prayer flags near Gallu Temple. Mcleodganj plays its cards close to its chest and yet, our exploration and persistence paid off this summer. We discovered two spots which have the best view over the city, Kangra hills and the Dhauladhars. These are spots no-one will tell you about, yet they are a must visit if you're in the neighbourhood. 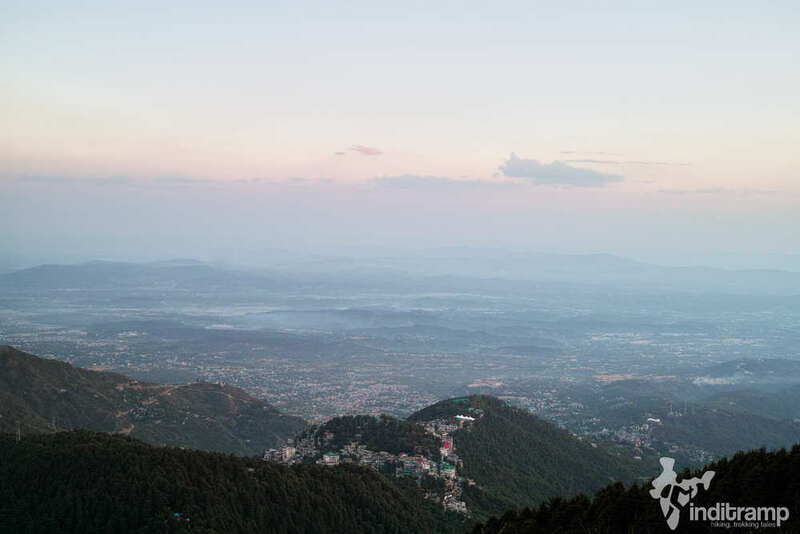 The first of these viewpoints is the sunset viewpoint, located a few hundred metres from Gallu Devi temple in Dharamkot. This secluded nook is the second best place to watch the sunset over the city and the Dhauladhars. What is the best place, you may wonder? For that, you will have to wait till next Friday. The setting sun paints the skies in subtle pastel hues. No HDR or high saturation in this image, just an attempt to capture the subtle colour gradations of the sunset. The starting point is a broad tree covered trail that starts from the car parking right opposite Rest-A-While cafe. This trail ends at a guest house that houses long-stay foreigners. Nevertheless, we need not walk all the way. This broad trail is parallel to the road that connects Gallu temple with Dharamkot. 300 metres from the starting point the trail bifurcates and there are a series of concrete steps leading up the ridge on your right. Climb these steps for the next 100 metres to the top of a knoll that houses a roofless Durga Mata temple. Someone has placed a “No Parking” sign just where the stairs end. We could not help but share a quiet chuckle at this illogical yet funny traffic sign in the middle of nowhere. The roofless temple resembles the Shikari Mata Temple at Janjehli that we visited in the winters. The view from this roofless temple is unparalleled as it overlooks Dharamkot and Gallu temple. Gallu Temple with its proliferation of Guest Houses, backed by its protective hillock. Two trails are clearly visible. the one on the right leads to Triund and the one on the left leads to Waterfall Cafe. From the temple another higher knoll with fluttering Tibetan prayer flags is visible. We recommend climbing the 200 metre to the flags because the Dhauladhars look spectacular from this knoll. 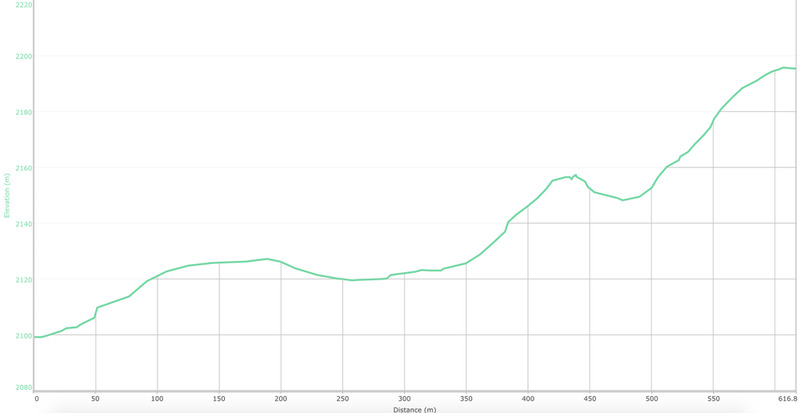 Elevation graph of the trail - what is this? The slope from the roofless Durga temple to the prayer flags is shale covered and slippery. Mind your step. Camera and all the lenses you can carry.